United Food and Commercial Workers Western States Council is pleased to announce the results of the largest and most comprehensive study of California’s food retail (grocery) industry to date. Shelved: How Wages and Working Conditions for California’s Food Retail Workers have Declined as the Industry has Thrived is authored by Saru Jayaraman of U.C. Berkeley’s Food Labor Research Center and co-founder/co-director of Restaurant Opportunities Center United, and U.C. Davis Associate Professor of Community and Regional Development Chris Benner, and was commissioned by UFCW Western States Council. The report contains data expected to have broad implications for the state’s grocery industry. California’s food retail industry employs approximately 400,000 Californians, or three percent of all workers in California. Over the last decade, the industry has grown year over year at a rate of two percent per year, including during recession years. But despite healthy growth in the industry, the report finds that workers’ wages have dramatically declined; since 1990, adjusted for inflation, wages for retail food employees have declined by 24 percent. Other findings from the report illustrate the ways that workers have suffered in a robust industry. Between 2000 -2011, grocery workers were over twice as likely to experience food insecurity (defined as being without access to a sufficient quantity of affordable, nutritious food) as workers in other industries. Up to one-third of all workers in California’s grocery industry rely on state assistance such as CalFresh or MediCal to meet basic needs. “The grocery industry was once seen as a reliable source for middle-class jobs in this state – workers could buy a house, put their kids through college, retire with a comfortable income. That these things are no longer possible and low-wage workers are being squeezed to the point of seeking out public assistance even as their employers grow richer points to a broader problem in our state, and one that affects all of us that live here,” said Jim Araby, Executive Director of UFCW Western States Council. Shelved: How Wages and Working Conditions for California’s Food Retail Workers have Declined as the Industry has Thrived was based on interviews with 925 workers, as well as official census and Bureau of Labor Statistics data. Please contact Sierra Feldner-Shaw (sierra@ufcwstatescouncil.org) for access to the full report in English or Executive Summary in Spanish. The United Food and Commercial Workers Western States Council is the regional coordinating body of 11 UFCW local unions representing over 200,000 workers in California, Arizona, Nevada and Utah. 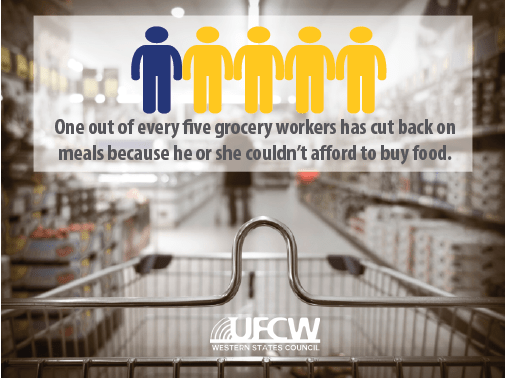 The Council is part of the 1.2 million member strong UFCW International Union.